Each Christmas I try to make one new handcrafted decoration. For the past few years I have worked on tree ornaments (here, here, and here) but this year inspiration struck in a different area. Stars! It all started with a cherry tree toppling in our woods. This tree had been dead and need to come down and when it fell, a major part of the trunk was suspend off the ground. This is important because when chain sawing, my husband hates it when the chain saw hits the dirt. It dulls the blade instantly. But with a trunk suspended I could request that he try and cut off some slices. And he did. 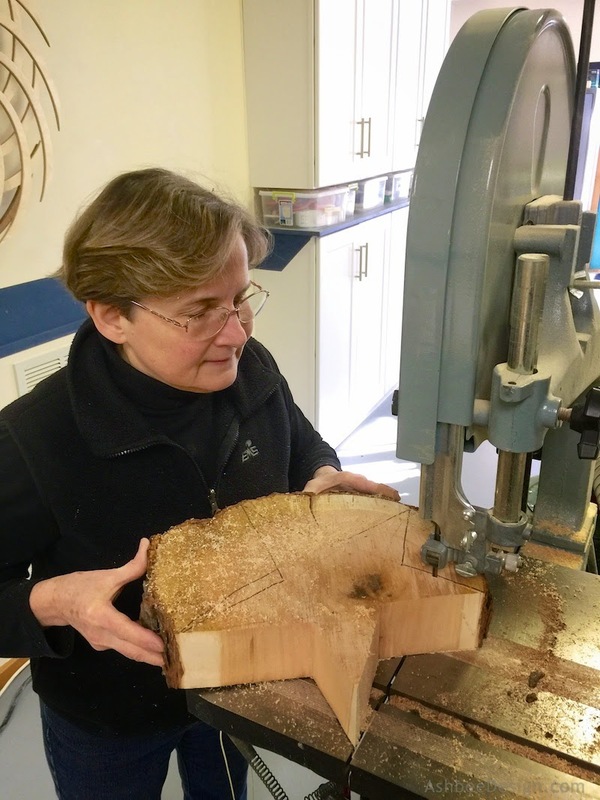 He cut me a selection of cherry slices about 14" in diameter and from 3/4 to 3" thick. I saved these in the top of the garage for the better part of a year and as they dried, they warped and cracked. They gained charter but also became rather limited in how I could use them with out major sanding. That is when inspiration struck. 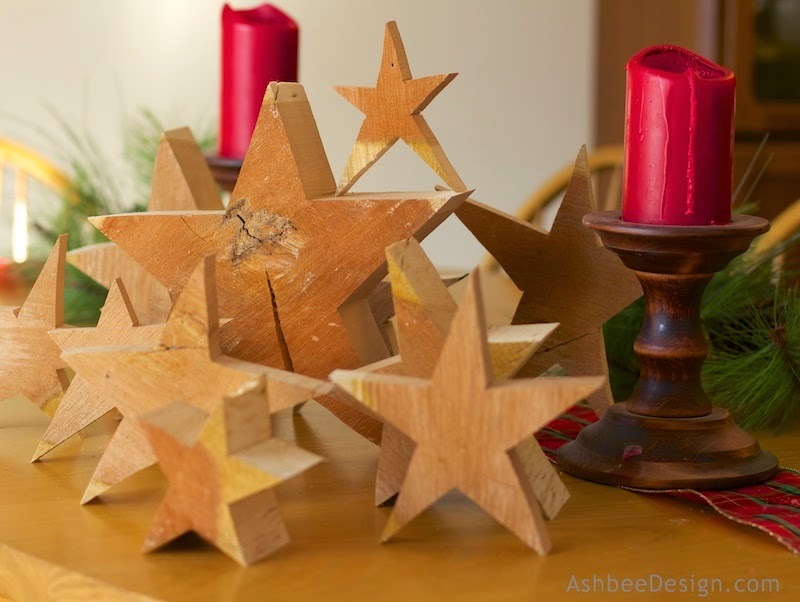 I decided to not sand them but to leave them rough sawn and create rustic stars. 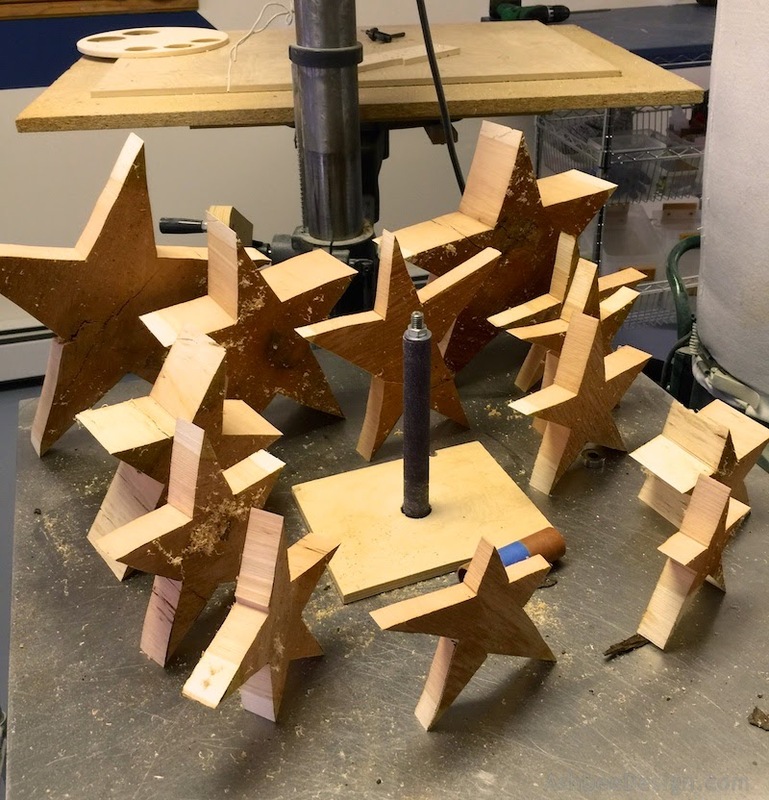 Using David's bandsaw I cut free form stars. I cut lots of them, in all thicknesses. I then I added them to my Christmas decor. This project combines lots of elements that I love - wood, rustic, and quick! And, during the holiday season I found little Swedi3h Tomtens hanging out among the stars. A neat project. I love how confident you are with the big power tools and that your husband lets you use them. The secret is that I taught him how to use them! 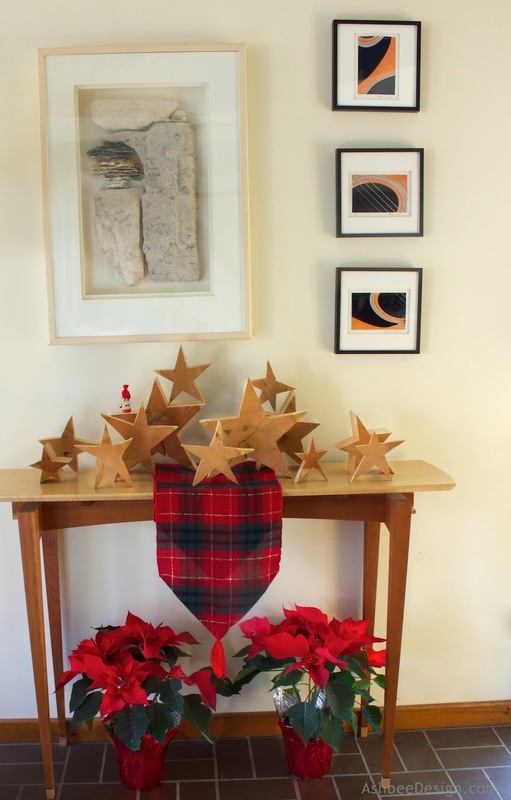 My college major is sculpture and I spent most of 2 years in the wood shop at RISD using all types of tools. Forty years ago I started teaching him. I must say that he kept it up and is much more skilled than I am now! I only use the tools occasionally but he uses them daily. And there are some I just don't like - like the router. So love your stars. They are perfect in their imperfection. Perfect you didn't paint them. For some reason I was on a star kick this year for holidays, made several paper stars decorated with stickers. different paper, as garlands, just kept on making them. 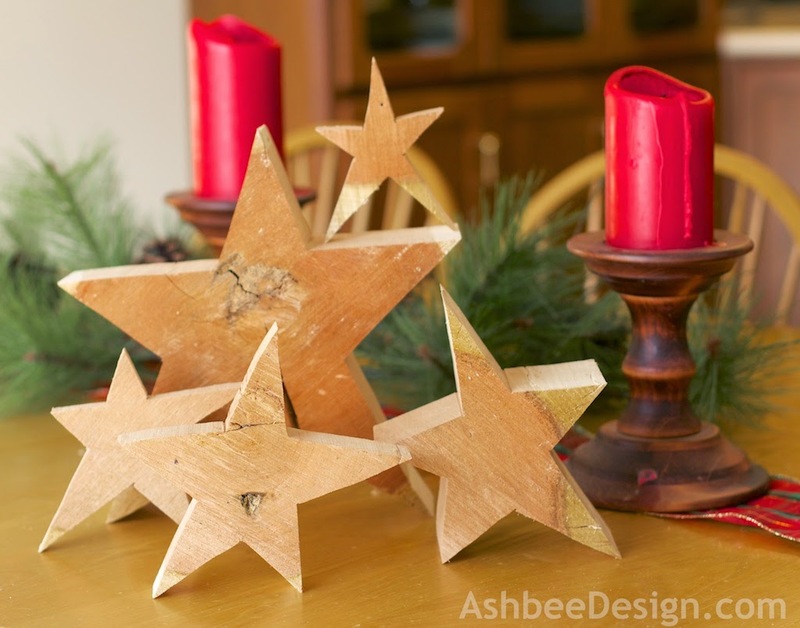 found some others I'd made other years so stars must be a favorite of mine, easy to make. I make alot of paper ornaments. 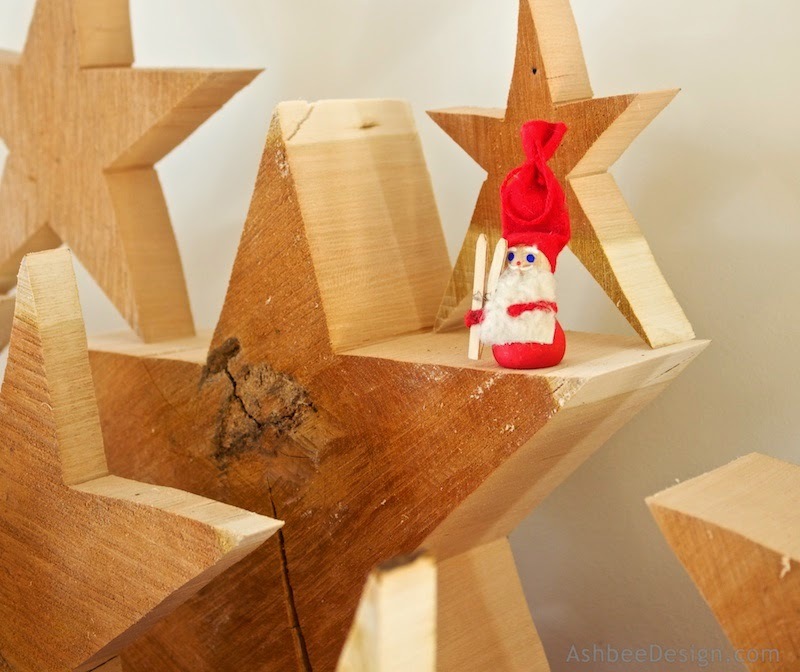 Hubs made some wood stars to go on wood trees he made. Good for you using those tools. I'm not allowed to use them so I don't end up cutting off appendages. My eye sight isn't that great and have no feeling or strength in hands. I use the sander but that's it, getting harder for me to use sander so hubs ends up doing most of work. i paint or stain that's it. You are so right - Simple is beautiful! Thanks for visiting and commenting and keep on creating! Let your hubs help where he can. Team work is a good thing.